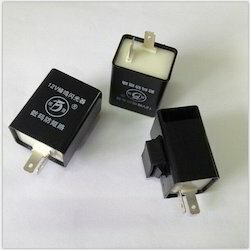 We can produce all types of relays, such as TELECOM, GENERAL, HIGH CURENT POWER, AUTOMOTIVE, FLASHER, LATCHING, AIR CONDITIONER, REED, INDUSTRIAL and MOTOR RELAY, Solid State, they widely use on many different applications. . Most of them have passed the safety certification by UL, CUL, TUV, VDE, CE organizations. 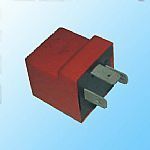 We offer a wide assortment of Flasher Relays to our clients, which is made up of high quality raw material and are widely used in the Indian automobile industry. These are available in different models, which can be customized as per the requirement of our clients. Moreover, we meet the bulk demand of our clients within a committed time frame across the globe. We deliver high quality products. - 3 Pin ISO type fittment. - 85±5 flashes per minute. - Epoxy sealed for water protection. Specification No. RDSO/SPN/173/2002 Amd-1, BRS-930, IRS-S-23 & IRS-S-34 as applicable. The Interlocking code shall be 'BCEHJ'.